Whack A Clown is a cranival themed redemption whacker game. Players must whack as many clowns as possible before the time runs out, with the different coloured clowns being worth different point values. Players must avoid the deadly Red clown to avoid losing points. A mechanical arrow meter displays the players skill level, and the machines are linkable for up to 8 games to allow players to compete against each other for big ticket values. 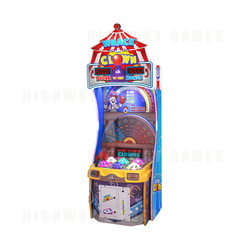 Sounds from the machine include classic carnival-style hecklers and sounds in order to bring the carnival feeling to life. This game is sure to be highly entertaining at any location.